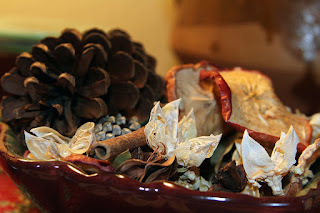 Today I'm sharing a recipe featuring oven-dried orange and apple slices, pine cones, anise and cinnamon sticks. It will make your house smell like fresh apple pie and the woods. A side note: If you don't want to make the potpourri recipe, simmer apple cider on the stove, instead. It will smell great, with the added bonus that you can drink it afterward.